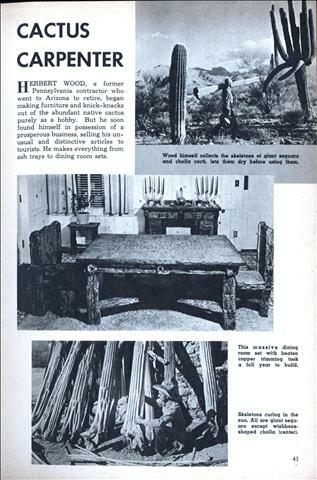 HERBERT WOOD, a former Pennsylvania contractor who went to Arizona to retire, began making furniture and knick-knacks out of the abundant native cactus purely as a hobby. But he soon found himself in possession of a prosperous business, selling his unusual and distinctive articles to tourists. He makes everything from ash trays to dining room sets.